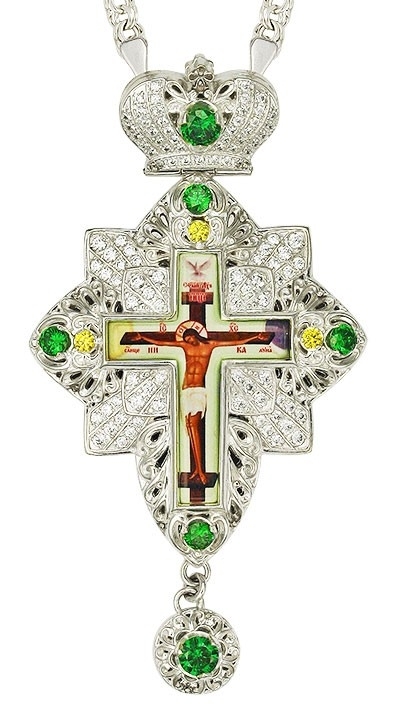 Pectoral cross - A160 (with chain) - Istok Church Supplies Corp.
Not a large pectoral cross of the eight-corner form is made of brass and covered with 24K silver-gilding. The large crucifixion was made using a special technology of applying a color image on a brass base. It is coated with a compound that protects it from mechanical damage and exposure to light. The front wall of the cross is convex, made as see-through one and decorated with a bulk of high-quality cubic zirconia of different sizes. The back wall of the cross is polished to a mirror shine, its shine reflects the glare of the stones and reinforces them many times.